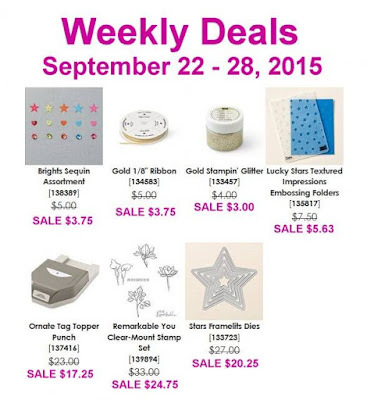 Wanted to pop in real quick and share with you the New WEEKLY DEALS for this week! Remember that the special Sale Price is only available on a limited quantity and once reached it will revert to full price - so don't delay if you've got your eye on some thing! Check out the REMARKABLE YOU stamp set! LOVE it! And the Star Framelits and Lucky Stars Embossing folder and who doesn't LOVE punches on sale!! There are so many GREAT items this week! Let me know if I can help you out!